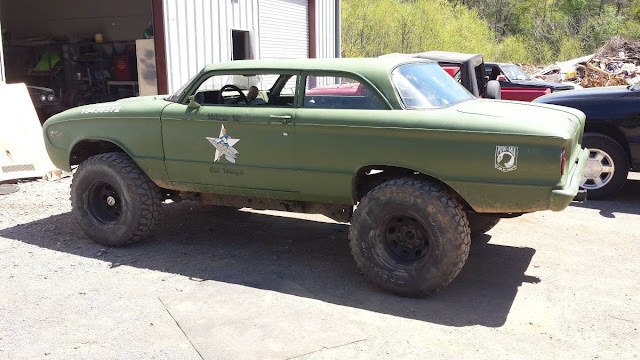 I've been mentally preparing for the 4th of July, when the DT tips inbox gets flooded with the most Muricanest beasts to travel across roads that line the amber waves of grain. But...what I wasn't prepared for was something that would be able to travel across the amber waves of grain with equal aplomb. 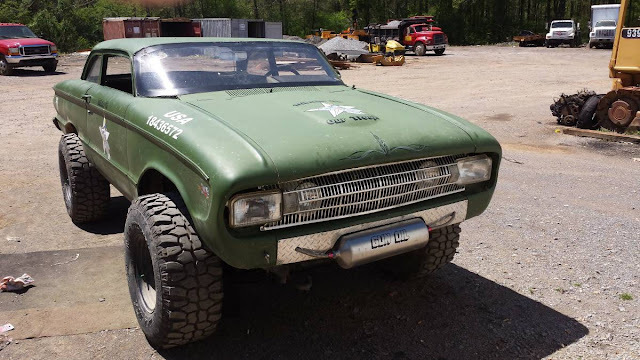 Find this 1961 Ford Falcon 4X4 offered for $5,700 near Huntsville, AL. Tip from Rock On! This thing is so American that it even has a Furrin heart. That's right, the Falcon body is sitting smack on top of a Nissan Pathfinder body/frame/running gear. So much for the 4th of July...eh? Still awesome! I would love to run this in our local flag day parade. The chop makes that Falcon look 50 feet long ... I like it Sweet Home AL. They aint right down there in the Heart of Dixie. Wheres the obligatory losers flag, the Starss and Bars? Sheeit. Easy tiger, no reason to bring up the War of Northern Aggression. Seller might want to rethink their logo use on the front tank....or not?